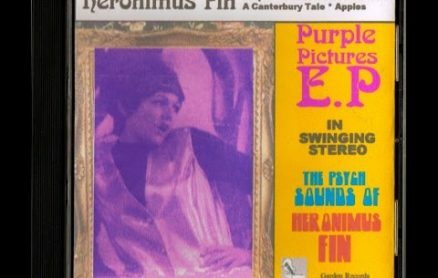 Formed in Birmingham in 1994 from the remnants of two Birmingham Punk Bands (Jon Buxton -Misspent Youth` & Paul Panic – The Accused) `Heronimus Fin` play 1960`s English style Psych/Underground Rock. Their 1st Album was released in 1995 on Garden Records called `The World According To…` followed by the E.P Release `Purple Pictures` in 1997 this was also the year that the band first entered the `Top 500 Collectible Artists` Poll in `Record Collector Magazine` where they stayed for 6 years peaking at #196 above the likes of The Stereophonics, Cream, The Eagles, The White Stripes, Foo Fighters, Robert Plant, Joe Satriani, Can and even Roger Waters. In 1998 the band released their 2nd album `Riding the Great Fantastic` which was closely followed in 1999 with their next E.P `Animal Tragic` released in conjunction with and to raise money for Monkey World in Dorset. The band appeared on Channel 4`s Big Breakfast & were featured on the then embryonic `Ideal World` shopping channel performing 3 songs. Due to their record label Garden records signing a distribution deal with BMG in 2001 `The World According To…` album was reissued simultaneously with a new release recorded live entitled `Bloodguilt`. At this point the band were invited by aficionado and booking agent Chris Alexander to play support to Roger Chapman (Family) at the Astoria 2 plus a half hour special on Paperlates 250th Anniversary Show in Holland with Uriah Heep, Richard Sinclair (Caravan) & Eddie Hardin (Spencer Davis Group).